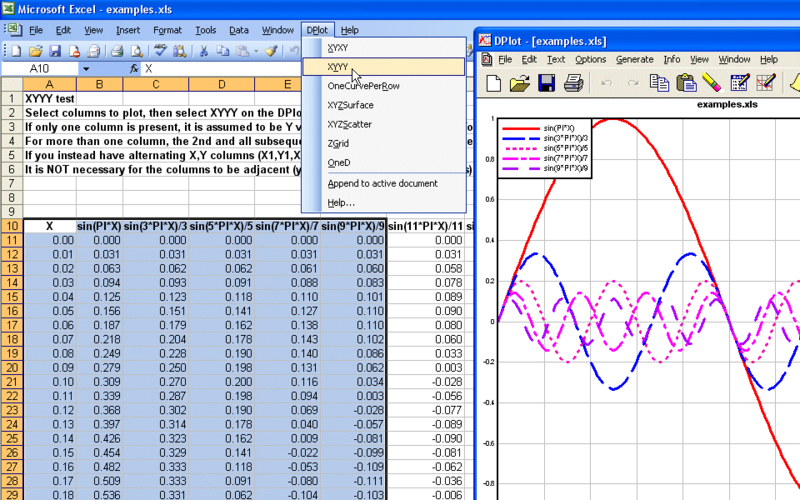 DPlot is a Windows program that lets Excel users create presentation-quality graphs from a wide variety of data sources. Whether you're a spreadsheet expert or you're using Excel to lay out your first financial statement, you'll benefit from DPlot's powerful graphing capabilities. For many spreadsheet users, the graphing capabilities built into the spreadsheet software can do the job. Today's Excel users, however, are used to seeing presentation-quality graphics in every medium, from cereal boxes to local TV news. Spreadsheet users need more sophistication to keep their stakeholders' attention. 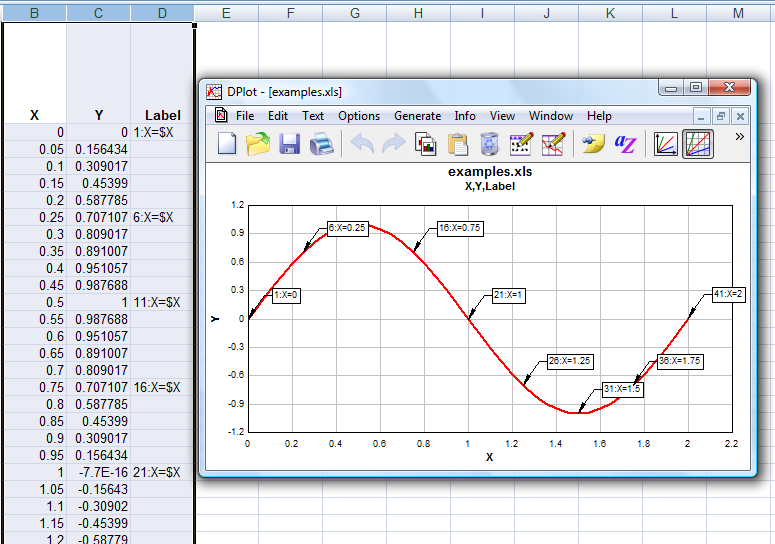 DPlot gives Microsoft Excel users the highest quality, most accurate graphs that are available on the Windows PC today. And by using captivating graphics in your presentations and other work projects, you can keep colleagues and managers interested in your work. DPlot turns team members into supporters. 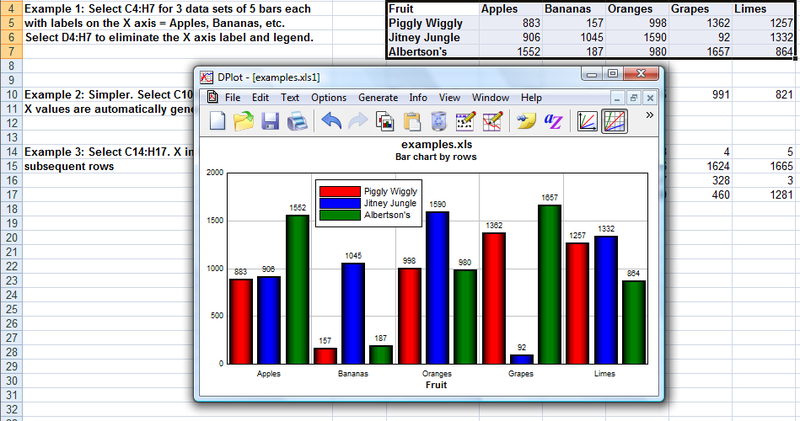 With DPlot, Excel users can utilize data files from a wide variety of sources, and turn them into graphs of all types. DPlot easily lays out the graphs the way you need them, and labels and annotates them. For added emphasis, it's easy to use photos or images as the background for your graphs. 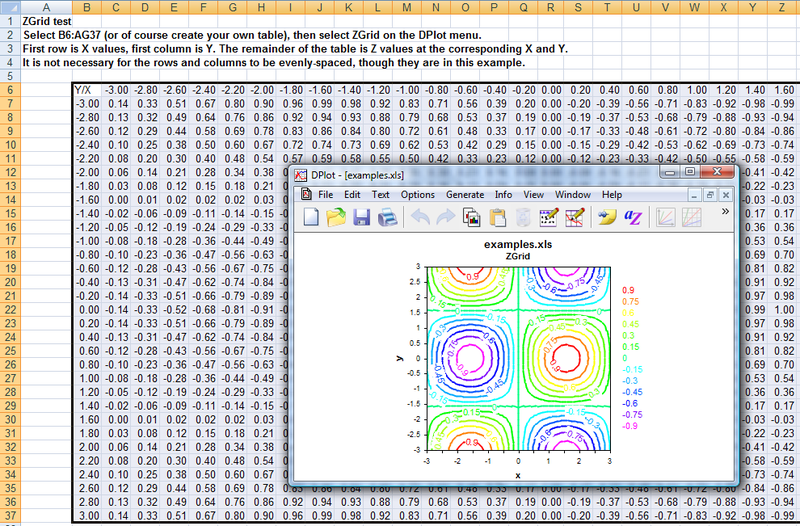 DPlot lets spreadsheet users graph and manipulate 1-, 2-, 3-, and 4-dimensional data. If you have a spreadsheet file or an ordinary comma-delimited file that contains statistics by year, or any groupings of figures, DPlot can grab the data, and lay it out for you in a huge variety of graphic representations. 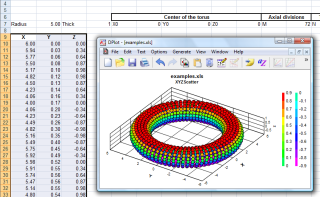 DPlot's Excel Add-In makes it simple for engineers, scientists, and mathematicians to move data in a variety of layouts from Microsoft Excel to DPlot. DPlot lets you display presentation-quality graphs in a number of graph types that are simply not available in Excel, including polar charts, triangle plots, Mercator projections and grain size distributions. These graphs support the work of financial professionals, sales managers, entrepreneurs, and students. See below for key Add-In features. Some of your colleagues and stakeholders learn well from your verbal presentations. Others can grasp numerical data more quickly if they see it displayed graphically. 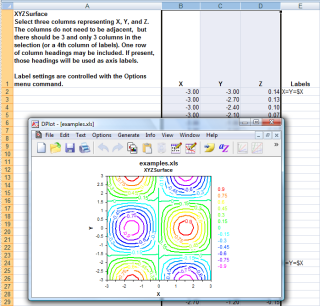 DPlot makes it easy for Excel users to turn data into graphics, effortlessly. 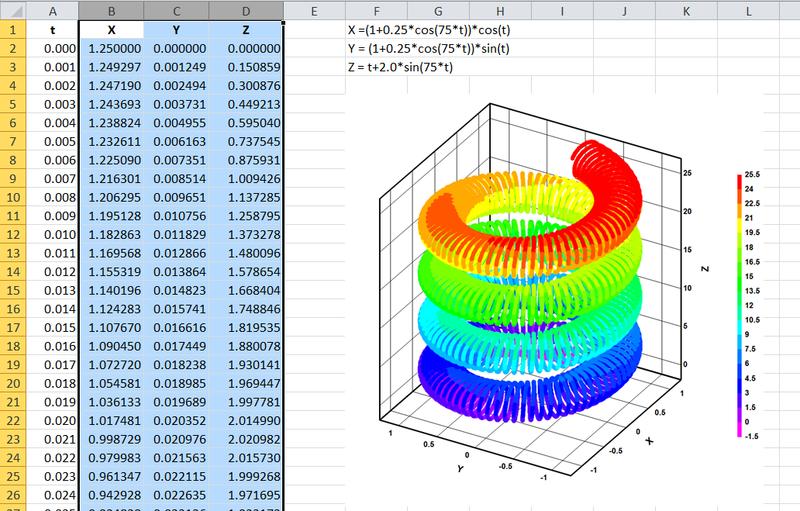 Sometimes Excel users need to create stunning contour plots of 3- and 4-dimensional data. Other times, a bare-bones chart can tell your story much more effectively than words. 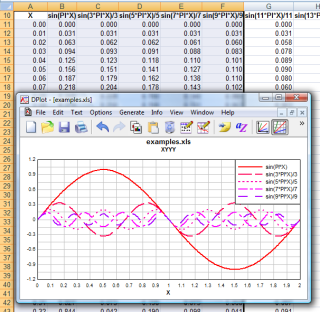 DPlot can meet all of your spreadsheet graphing needs. Regardless of the subject matter of your spreadsheets, DPlot can help you illustrate specific functions and formulas effectively. DPlot can enhance your proposals, journal articles, status reports, and project summaries. Colleagues and management are not the only target audiences for Excel users. Your spreadsheet work may be examined by stakeholders as diverse as government regulators, potential investors in your company, and journalists who can help you educate the public. Impress all of your stakeholders by delivering numerical information clearly, graphically. A single-user DPlot license costs $195(US), and will improve all of your graphs and charts now, and for years to come. For most functions, you may use multiple selections if your data columns are not adjacent or if your data is otherwise not arranged as expected (Y column preceding X, for example). Data is passed as floating point numbers and internally is independent of the formatting. Blank cells are interpreted as you'd expect (rather than filling with 0's, for example). 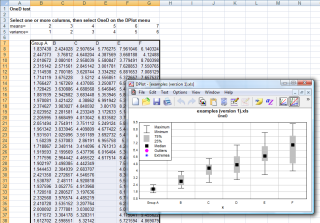 Most functions attempt to use the same formatting in DPlot that is used in Excel (dates and/or times, for example). 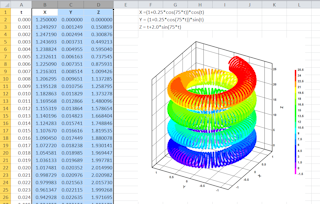 Select alternating X,Y columns and produce an XY plot. Column selections may have differing numbers of rows. As with all XY plots produced by the Add-In, the plot will initially use linear scaling on both the X and Y axes and draw line segments between each data point. 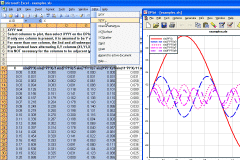 To use a logarithmic or probability scale on either axis or to display the data as a bar chart, polar chart, or any of the other graph types supported by DPlot, right-click on the graph and select the appropriate type. To change the line style, symbol style, line width, symbol height, or color of any curve on the graph simply right-click on a graph to display a drop-down menu. Corresponding commands for all of these options are on the Options menu in DPlot. 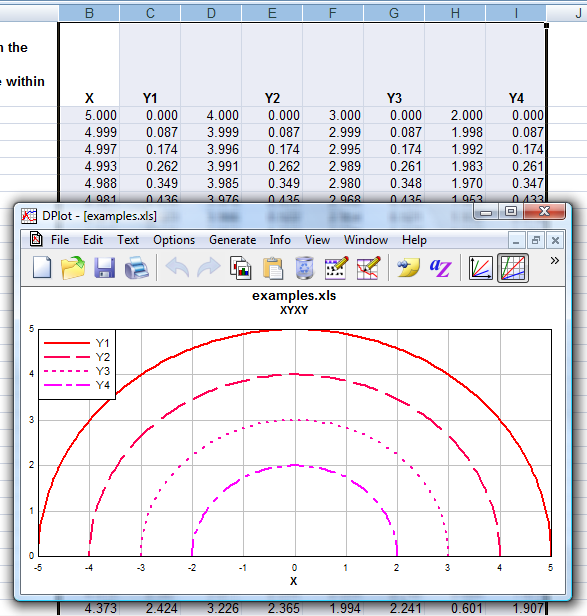 Same as above, but X is taken from the first selected column and all subsequently-selected columns are Y values for separate curves. If only one column is selected, it is assumed to be Y values and X is generated, starting at 0 and incremented by 1. Y columns may have blank cells. 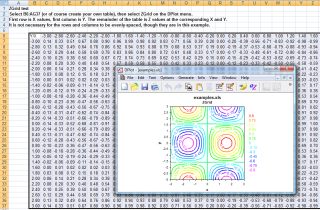 Creates 1 curve on an XY plot with X taken from the first selected column, Y taken from the second selected column, and text labels in the third column. Label cells may be blank. 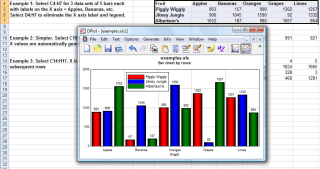 Creates a bar chart with non-numeric labels on the X axis and 1 or more groups of amplitudes. In DPlot right-click on the plot and select Bar Chart Options to specify the fill style, width, spacing, orientation, and other characteristics of the plot. See the Bar Chart page for more information. 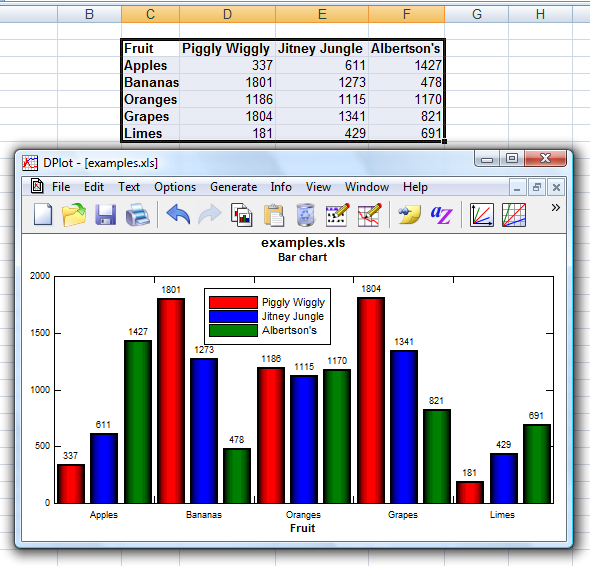 Same as Bar chart command, with data sets in the same row rather than the same column. 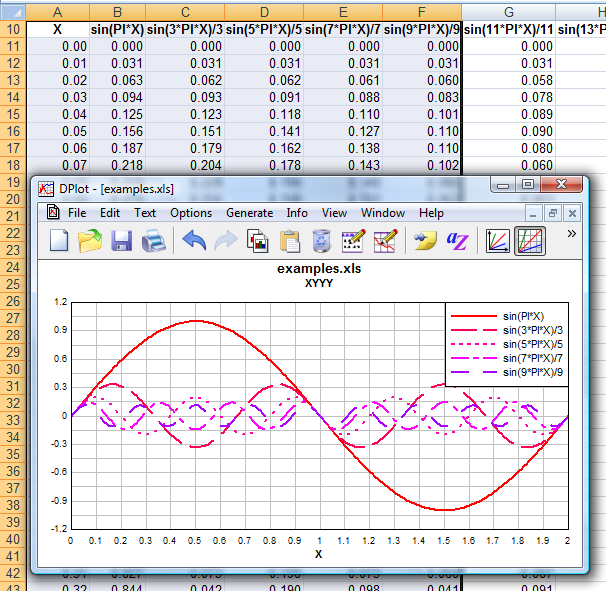 Similar to XYXY, but data is arranged by rows rather than columns, with alternating X and Y values in adjacent columns. Each row is used to produce one curve. Select an X, a Y, and a Z column (one or more selections). 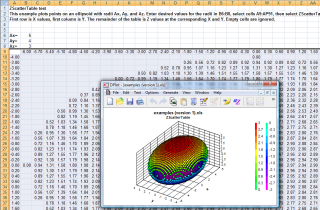 Produce a 3D surface plot. The plot will initially be drawn in 2D with contour lines. To switch to a 3D view or use shaded color bands rather than contour lines, right-click on the plot and select "Contour Options". 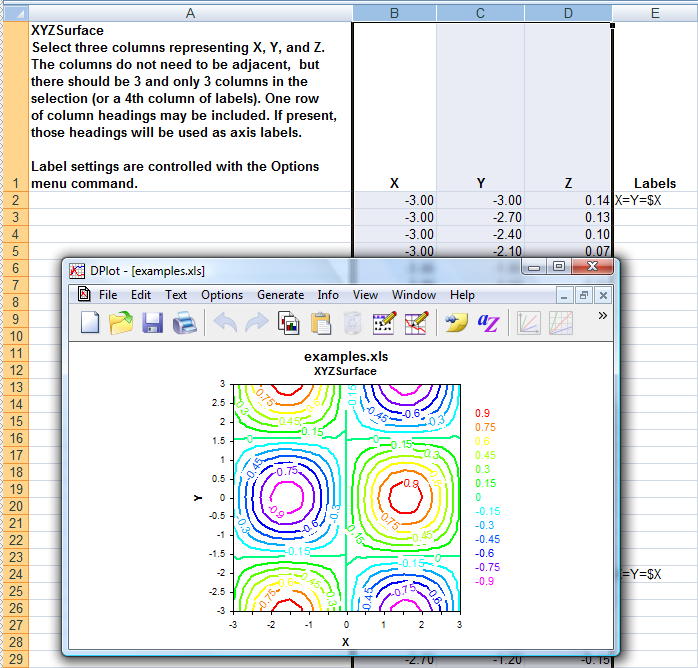 Select one or more groups of X,Y,Z columns and produce a 3D scatter plot, one data set per X,Y,Z group. Select a table with X in the first row, Y in the first column, and the remainder of the table filled with Z values for the corresponding X and Y. 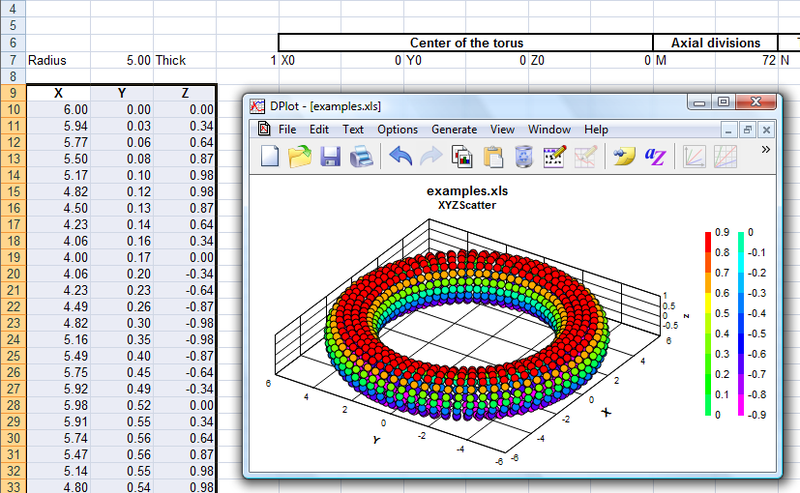 Produces a 3D surface plot. It is not necessary for X and Y to be evenly-spaced. 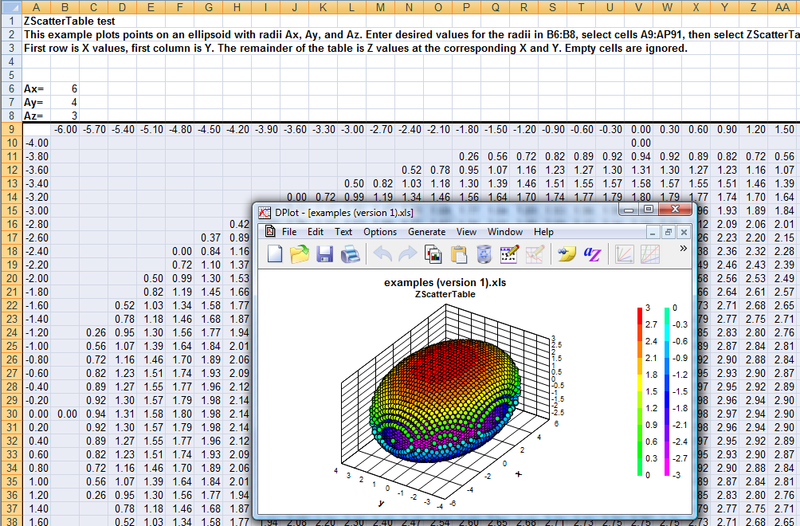 Very similar to ZGrid, but produces a scatter plot rather than a surface plot. (One consequence of this distinction is that you may have multiple points sharing the same X,Y coordinates.) Select a table with X in the first row, Y in the first column, and the remainder of the table filled with Z values for the corresponding X and Y. Select one or more columns of amplitudes and produce a box-and-whisker plot. 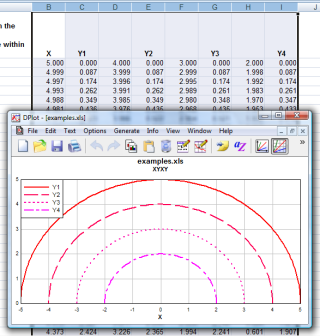 Switch to a dot graph by right-clicking on the plot and selecting "Dot Graph". Various plot parameters, e.g. the definitions of outliers and extremes, whether the plot is mean- or median-based, etc., are accessible via the "Format" command on the right-click menu. If you elect to install the optional Add-In during setup everything should proceed smoothly on Windows 95 or later and all versions of Excel from Excel 97 through 2010. Your security settings may prevent the installation from being completed, but with a few short steps you should be able to manually finish the installation. If you installed the Add-In but do not see a DPlot menu in Excel, see the Using the DPlot Interface Add-In for Microsoft Excel topic in the online manual. 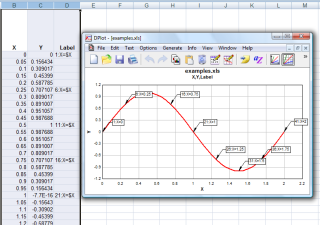 "With my trusty Excel addin installed, I NEVER use the Excel plot routines even for simple plots. The speed presentation and flexibility are incredible. I scratch the surface but am aware of the extreme power this package represents, it outmodes anything Excel or any other package has to offer at a bargain price. The support is quick and accurate." 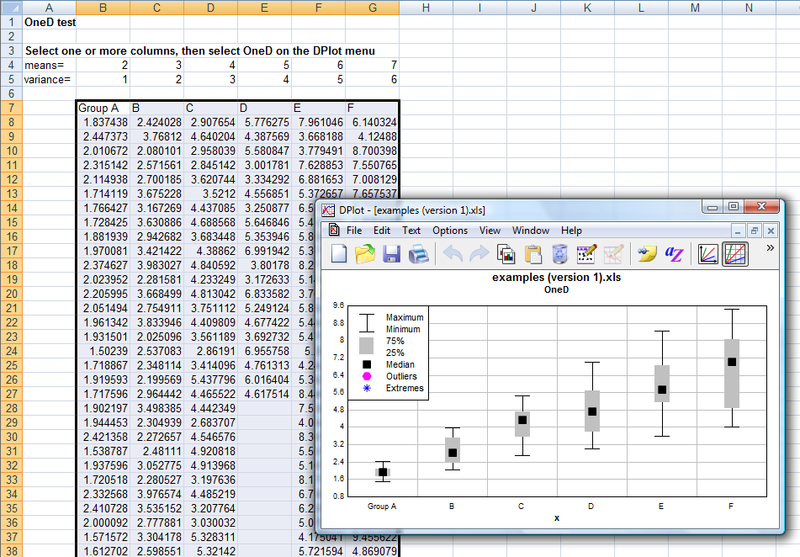 "Holy !#%$... Did I just create a graph with 2 clicks from Excel?